In wonder over God's world, God's word, and God's redeeming love. Coincidence? No way. In describing Jesus, Luke is deliberately echoing the words first attributed to Samuel. The connection between Jesus and Samuel becomes even stronger when other parallels between the two are noted. Consider, for example, the miraculous peculiarity of each child’s conception. Much is made of the fact that Hannah, Samuel’s mother, is barren until the Lord opens her womb (1 Samuel 1). Mary, of course, is a virgin who experiences the uber-miracle of conception, being overshadowed by the power of the Most High himself (Luke 1:26-38). Then there is the matter of the mothers in prayer. Both Hannah and Mary exult in God over the gift of their child. Now that in itself isn’t unusual. We would expect that believing women would pray, especially when they know their pregnancies to be miraculous. What is unusual about the prayers of these two mothers is that they are recorded for us in detail and are remarkably similar in content (cp. 1 Samuel 2:1-10; Luke 1:46-55). In fact, Mary seems to be directly alluding to Hannah’s prayer in her own prayer. One other parallel is worth noting. The structure of the narratives of Samuel and Jesus follow a similar pattern leading up to their public ministries. 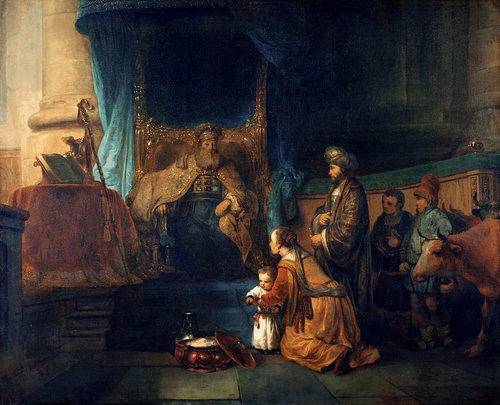 In 1 Samuel, the narrative clearly alternates between Samuel and Eli’s sons, setting up a contrast between the two (1 Samuel 1-3). Equally clearly, Luke takes the same approach in crafting his narrative, alternating between John the Baptist and Jesus (Luke 1-3). This similarity of structure could simply be a mark of good storytelling. But given the deliberate echo of 1 Samuel 2:26 in Luke 2:52, plus the additional parallels of miraculous pregnancies and the mothers’ prayers, I believe we are right in detecting another parallel in the structures of the stories themselves. The conclusion seems obvious: Luke is making an intentional connection between Samuel and Jesus. The question is, Why? The most likely answer is that Luke sees Samuel as a type of Christ. By type I mean a shadow, the substance of which is found in Jesus. As Jesus would say of himself that “something greater than Jonah is here,” and, “something greater than Solomon is here” (Mark 12:21-22), Luke is saying of Jesus that something greater than Samuel is here. That’s how types work. The original figure is similar in some way to the reality to which it points; but the reality, when it arrives, is greater. So, Jesus is like Jonah, only Jesus’ call to repentance is more momentous than Jonah’s. Jesus is like Solomon, only Jesus’ wisdom exceeds that of Solomon. And in the Gospel of Luke we are learning that Jesus is like Samuel … but in what way? These two men, Samuel and Jesus, are alike in the transitions they represent. Samuel was a pivotal figure in the history of redemption, serving as a bridge between the judges and the monarchy. Kingship came through Samuel, and along with it the promise of an eternal King. Israel would never be the same. Like Samuel, but greater, is the transition that comes in Jesus. To say that Jesus is a pivotal figure in the history of redemption is an understatement. Jesus fulfilled the old covenant and established the new covenant in his blood. He is the long-awaited King, whose coming has changed not only Israel but the world. No wonder Luke echoes the person of Samuel in introducing us to Jesus. A new era dawned with each of these men. But Luke’s point is that In Jesus, one greater than Samuel is here. Can You Make It to the Next Tree?